Travel advice for Kyiv (Kiev) is constantly changing due to current events. Keep updated with the latest Ukraine travel advice. One of the oldest cities in Eastern Europe, Kyiv (Kiev) is also one of the loveliest and boasts a beguiling blend of opulent mediaeval architecture and stark Stalinist blocks. A place of broad boulevards and onion-domed churches, there’s no shortage of things to see, while its burgeoning restaurant scene, seemingly untroubled by recent events, continues to grow. Nevertheless, the events that led up to the Donbass conflict in eastern Ukraine have left their mark, not least in the main square Maidan Nezalezhnosti, which remains a hub for public demonstrations and rallies. Even so, there’s a sort of eerie calm about daily life in Kyiv (Kiev) which continues against a backdrop of political turmoil and fighting. None of that, however, has made much of a mark on Kyiv's (Kiev's) main attractions, among them Khreschatyk, the city's main shopping street, which still bustles with life and the opportunity to pick up anything from designer clothes to Soviet era antiques. Most picturesque of all is Andriyivsky Uzviz (Andrew’s Descent), a cobbled hill packed with traders and tiny museums. Beautiful though it is, Andriyivsky Uzviv cannot compete with Kyiv's (Kiev's) spectacular ecclesiastical architecture, like the striking Kyiv Pechersk Lavra (Monastery of the Caves). This collection of beautiful churches overlooking the Dnieper River is not only Kyiv's (Kiev's) most famous sight but also a place to come and witness the dignified religious fervour of the Ukrainian Orthodox faithful. 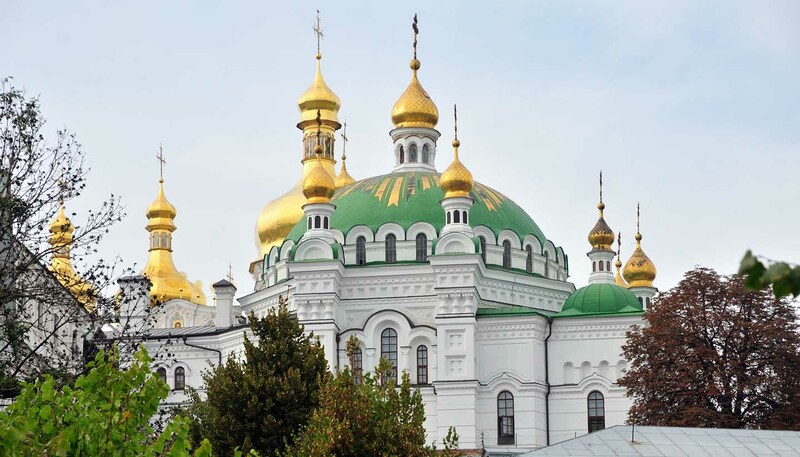 The only other church to come close to matching it is the UNESCO-listed St Sophia’s Cathedral which boasts stunning golden domes as well as the magnificent Virgin Orans mosaic. But there’s more to Kyiv (Kiev) than churches and shopping. Recent decades have seen the city develop a reputation for pulsating nightlife, which goes on despite the war. The city is also awash with museums, including one dedicated to Chernobyl, a nearby town that was abandoned following a nuclear meltdown.